An off-duty New Jersey police officer and former Marine was the Rangers fan brutally beaten in a fight outside a cheesesteak shop in Philadelphia following Monday's Winter Classic hockey game, NBC New York has learned. 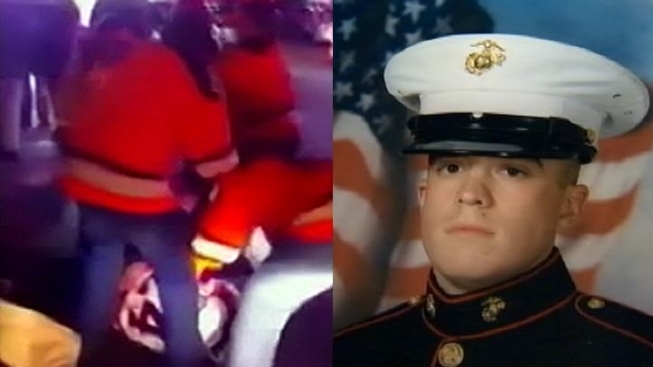 Neal Auricchio, 30, has worn the uniforms of the Marine Corps and the Woodbridge Police Department, but it appeared to be his Rangers hockey jersey that made him a target of the attack earlier this week. "He got banged up pretty badly," his father Neal Auricchio Sr., told NBC New York Wednesday. "Stitches in the one eye, and the other eye is pretty puffed up. He went for a CAT scan today, and we're waiting for the results on that." Video of the assault was posted to YouTube Monday night after the classic ended with a Rangers win. Three men wearing Flyers jerseys were seen in the video assaulting two men wearing Rangers jerseys in front of the famed Geno's Steaks eatery. 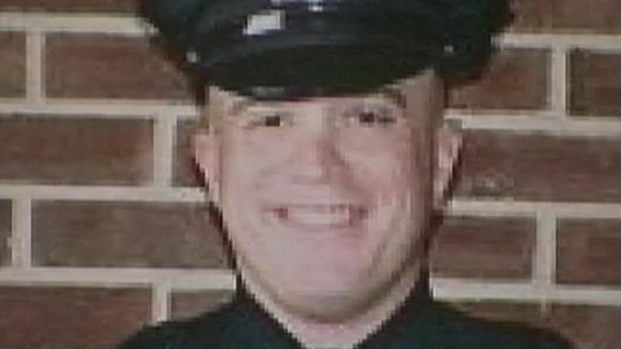 A Woodbridge police officer and former Marine who was wounded in Iraq is recovering after he was beaten in Philadelphia Monday night. Brian Thompson has more community reaction. Police in Philadelphia said the brawl started when the Flyers fans in the orange jerseys paid a man who was cleaning car windows to spray a Ranger fan with some sort of liquid. A man wearing a No. 28 Claude Giroux Flyers jersey first goaded, then swung at a man in a No. 24 Ryan Callahan Rangers jersey, officials say the video shows. A melee ensued, and the man in the Rangers jersey punched back but was quickly taken to the ground where two other apparent Flyers fans joined in. It wasn't clear from the video who Auricchio was, but sources tell NBC New York the off-duty patrolman was beaten so severely he was hospitalized with a concussion. The video drew a firestorm of criticism from neighbors in Woodbridge, where Auricchio grew up, and where the other man seen being attacked in the video -- a friend of Auricchio's -- still lives. "Because of what he's wearing, he sucker punches him and then even after the guy gets up again, he sucker punches him again," said John Jorgensen, a customer at a Woodbridge diner who had seen the video. "That's really low." At the Rio Diner downtown, one man thought the video was a reflection on Philadelphia sports fans. "It reflects poorly on the entire community," said Michael Schaff of East Brunswick. "It can happen anywhere. Unfortunately, it happens a lot more in Philadelphia than elsewhere." Bill Fong, also of East Brunswick, disagreed. "I think it was more of an isolated incident," said Fong, maintaining he was still a Philadelphia sports fan. Auricchio, a former Marine, earned a Purple Heart in Iraq, and even went back for a second tour after he was shot in the leg. Woodbridge Mayor John McCormac, a friend of the family, visited Auricchio's home Wednesday. He told NBC New York he hoped that witnesses to the senseless beating will come forward and bring the attackers to justice. "We root, we play, we win, we lose, and we go on," he said. "And regardless of the result of the game, this should not have happened to a good, decent young man who's truly a war hero." The younger Auricchio spent Wednesday night at home with his wife and son, who was born just a few days before Christmas, his father said. He returned to Philadelphia Thursday to talk to police there about the incident. Woodbridge Police Director Robert Hubner said he expected Auricchio, a four-year veteran of the department, to return to work. "We expect a full recovery, we expect him back to work as soon as he's possible -- he feels well enough to get back," he said.